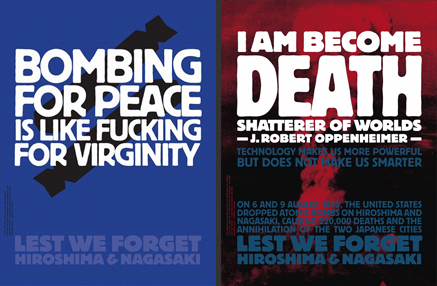 Lest We Forget… posters for peace. “War has long been a subject of the arts and within this genre posters have been important vehicles for communication. Posters are used to arouse public opinion. They reflect changes in attitudes, political trends and social issues. They are advertisements and sources of information. In short, posters are a record of the time. Robert L. Peters was one of 24 designers invited to contribute posters for Lest We Forget: Canadian Designers on War, an exhibit which opened at the Citadel Theatre in Edmonton, Alberta today under the auspices of The Works Art and Design Festival.